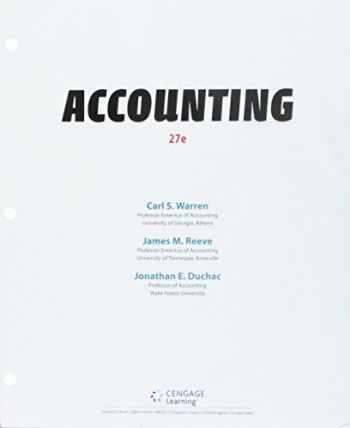 Acknowledged author Carl S. Warren wrote Bundle: Accounting, Loose-leaf Version, 27th + CengageNOWv2, 2 terms Printed Access Card comprising 1312 pages back in 2017. Textbook and etextbook are published under ISBN 1337587427 and 9781337587426. Since then Bundle: Accounting, Loose-leaf Version, 27th + CengageNOWv2, 2 terms Printed Access Card textbook received total rating of 4 stars and was available to sell back to BooksRun online for the top buyback price of $82.00 or rent at the marketplace. Students save money by purchasing this Bundle which includes a loose-leaf version of Accounting, 27th and an access code for CengageNOWv2. Have the tools you need to be successful. A variety of tools are available in CengageNOWv2, all combined in one easy-to-use resource designed to improve your grades. Some resources get you prepared for class and help you succeed on homework, while others show you specific areas where you can work to improve. This access code entitles you to 2 non-consecutive course enrollments. The duration of the code is course length +14 days.